A dangerous cold snap and a southern snowfall dominate the weather headlines this week as a piece of the polar vortex—yes, that fake-sounding but very-real weather phenomenon—dips over the Upper Midwest and sends temperatures plummeting almost as far as they can go outside of the Arctic Circle. Wind chill values will come in dramatically lower, subjecting anyone caught exposed outside to frostbite or hypothermia in a matter of minutes. Here's a timeline of how the next couple of days will play out. 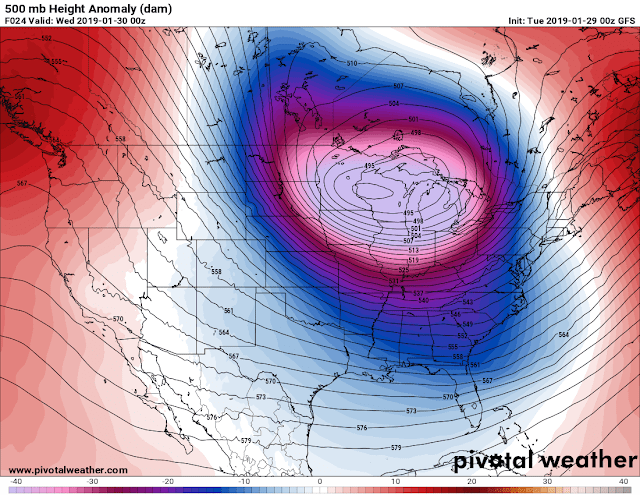 A piece of the polar vortex is responsible for the intense cold snap that will envelop the northern states this week. You can see the upper-level low in the model image at the top of this post (source: PivotalWeather). The image shows height anomalies, and those pinks and whites indicate that the upper-level low is much stronger than what you'd normally expect to see in this part of the country at this time of the year. The polar vortex is a persistent upper-level circulation that encircles the Arctic during the winter months. The circulation is usually pretty smooth and stable, but an active pattern can cause it to become wavy, allowing bitterly-cold air to flow south to the lower latitudes. A piece of the circulation broke off a few days ago and the resulting upper-level low is moving south toward the Great Lakes, bringing with it some of the coldest air the region has seen in years. The bitter cold will begin to set in across the Midwest and the Great Lakes on Tuesday as the upper-level low settles into place. Highs across the two regions will struggle to climb above zero for a couple of days. 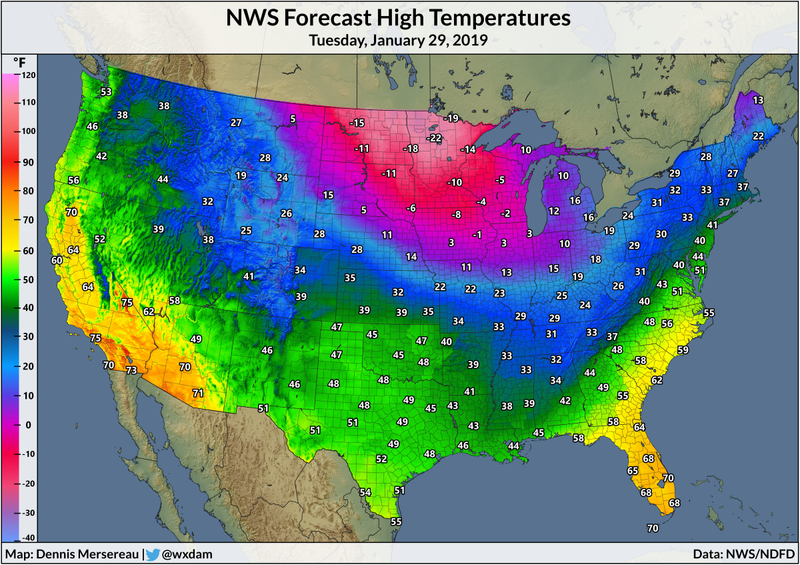 The latest National Weather Service forecast shows most of Minnesota spending Tuesday in the double-digits below zero—these are daytime highs, mind you—with nearby states like Wisconsin, the Dakotas, and parts of Iowa and Illinois spending the heat of the afternoon hovering around zero. Wind chill values on Tuesday could come in 20°F or more lower than the actual air temperature. The wind chill is what it feels like on your skin when you combine the air temperature and the wind speed. Some folks like to argue that it's a "fake" temperature meant to scare people and drive ratings—a former editor even flippantly tweeted that I had a brain defect for asserting that the heat index and wind chill are valid measurements based on scientific studies—but, despite the naysayers, the wind chill has a real effect on the human body. 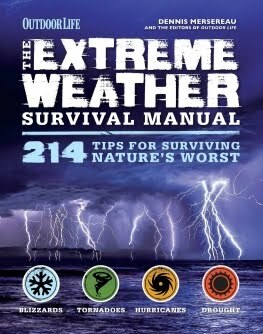 A temperature of -10°F with a 5 MPH wind has the same effect on your body as an actual air temperature of -21°F, meaning that frostbite and hypothermia will set in even more quickly than it would if there was no wind at all. It's not meant to trick you into thinking it's colder than it really is. It's meant to tell you that the cold air can hurt you faster than you realize. Farther to the south, we're dealing with another issue that could cause society to completely fall apart: measurable snow in the southeast. 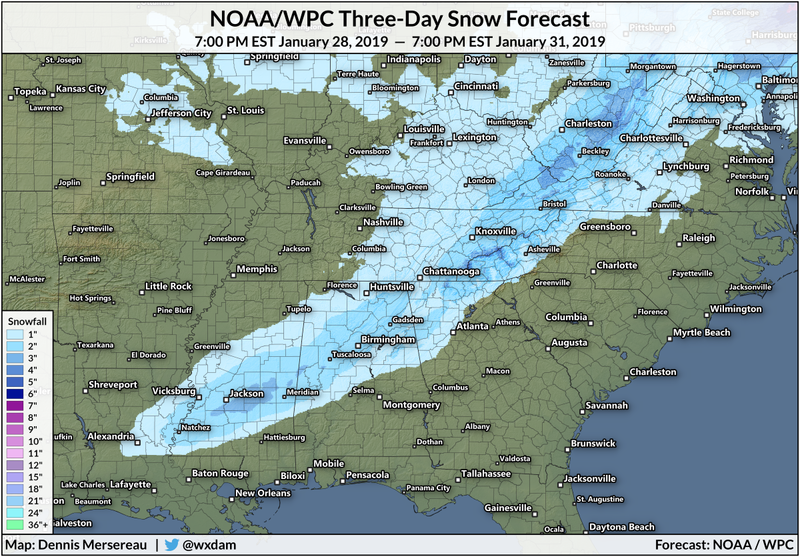 Communities from Baton Rouge to Atlanta could see an inch or two of snow as a cold front moves through the region on Tuesday. Snow doesn't play well in the south. Drivers can't handle it and some localities don't have the equipment to remove it from the roads right away. Most schools in the affected areas are already closed, so hopefully there won't be any ice-related catastrophes like we've seen in recent years. That southern snow shouldn't stick around too long, but the combination of melting snow and puddles from rain will make roads icy all across the Southeast and Mid-Atlantic on Wednesday morning. Some roads will become skating rinks as temperatures plummet below freezing not long after the end of the precipitation. Wednesday morning will feel cruel and unforgiving in the Midwest. The NWS predicts that Minneapolis could hit -30°F, which would be the coldest temperature the city has recorded since a -32°F low on February 2, 1996. 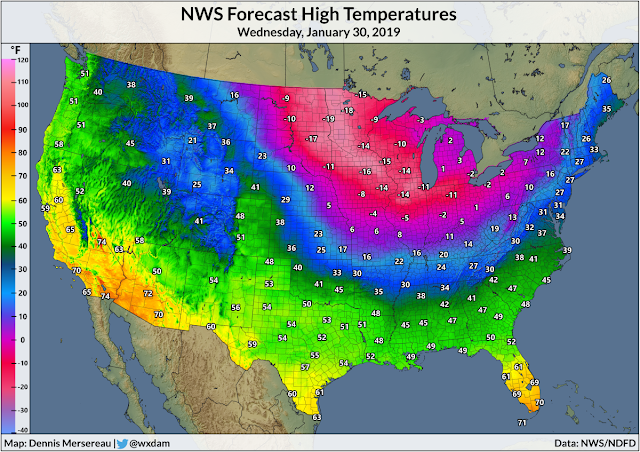 Wednesday's low in Chicago will come close to -20°F, and subzero temperatures are forecast to reach as far south as St. Louis and Kansas City. Wind chills on Wednesday morning will drop into the -60s (that's negative-sixties) in Minnesota, Wisconsin, and the eastern Dakotas, which can lead to frostbite on exposed skin in the time it takes to walk across a large parking lot. The snow will be long gone in the southeast when it's just getting cranked up in the Northeast and Great Lakes. Two separate snow events will take place on Tuesday night and Wednesday. 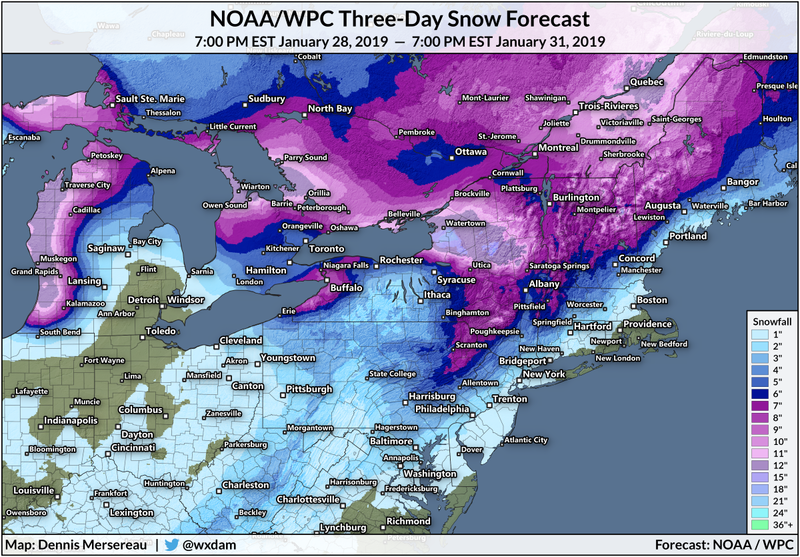 The latest snowfall forecast from the Weather Prediction Center shows several inches of snow falling along the I-95 corridor from Virginia to Maine. The heaviest snow will fall in the interior Northeast, where the highest elevations could see up to a foot of snow, with even more possible downwind of Lake Ontario. Western Michigan will see a significant lake effect snowstorm on Wednesday and Thursday as westerly winds pump bitterly cold air over an unfrozen Lake Michigan. Traverse City, Muskegon, and possibly even Grand Rapids could see a foot or more of snow by Thursday evening. High temperatures on Wednesday will...not be all that high. 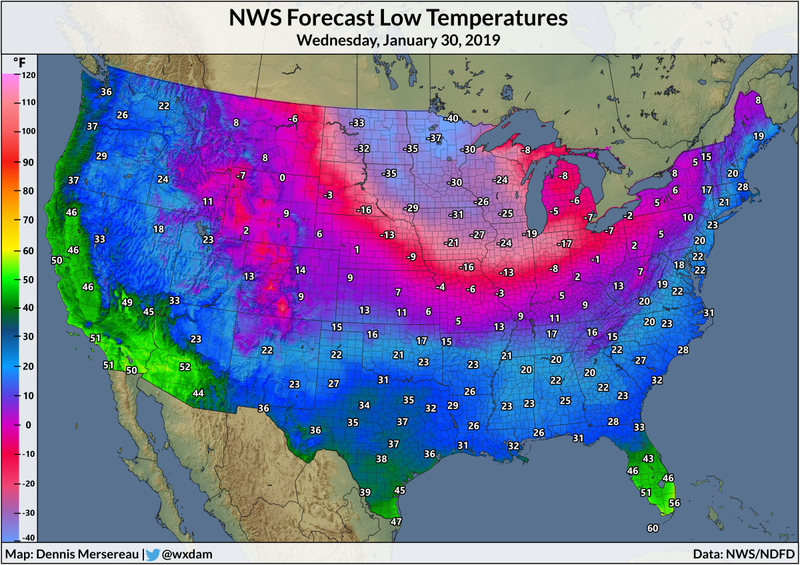 The good folks at the National Weather Service don't see temperatures climbing above zero across the entire states of Minnesota and Wisconsin. Single-digit highs are possible as far south as St. Louis, Cincinnati, and as far east as western New York. It will be 72°F in Phoenix on Wednesday. Lows on Thursday morning will be just as bad as Wednesday—if not a little worse—across the hardest-hit areas. 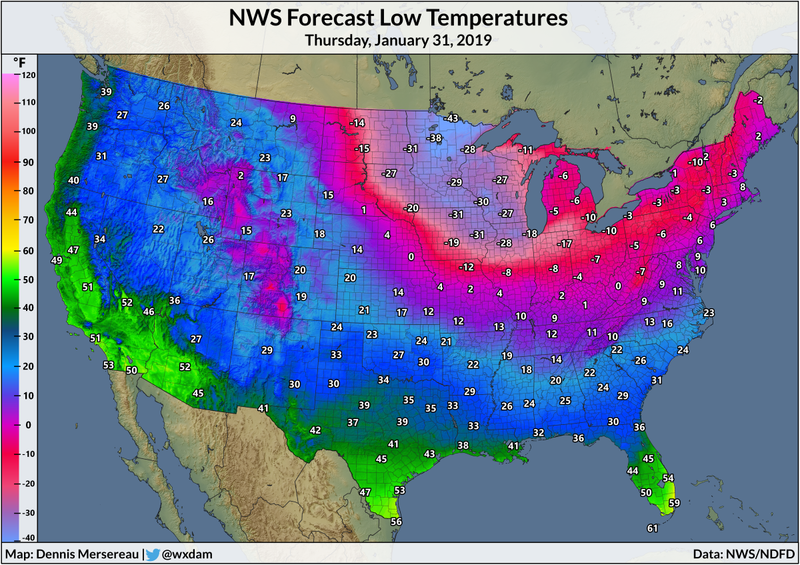 International Falls could chime in with a temperature of -43°F, while Minneapolis and Chicago remain just about the same as they were 24 hours earlier. The sub-zero temperatures will spread farther east on Thursday morning. The good folks at the NWS expect Scranton (what? the Electric City!) to reach -4°F and Washington, D.C., to enjoy a balmy low of 8°F. You can still generously call Thursday's high temperatures "frigid," but they'll be on their way up as the upper-level low responsible for the Arctic outburst begins to retreat back into the depths of Canada where it belongs. 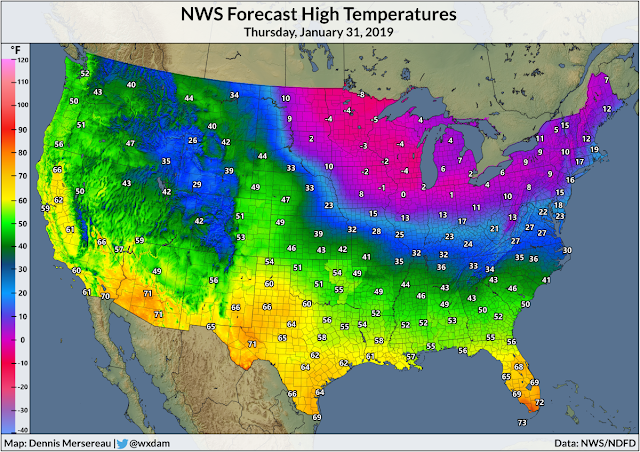 You can see hints of a ridge building in the southern United States, where temperatures across Texas will come in around short-sleeves-and-open-windows degrees. 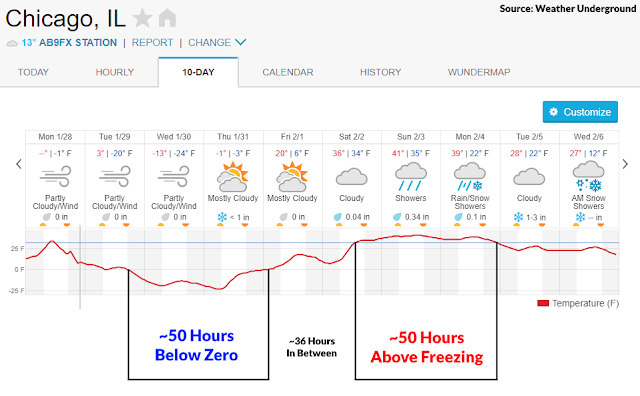 Chicago will go from about 50 hours of sub-zero temperatures to about 50 hours of above-freezing temperatures with just 36 hours separating the two events. This cold will seem never-ending, but it's going to end in a hurry. The flash-freeze and flash-defrost could lead to big issues for homeowners and public works crews as pipes and roads suddenly expand from the wild temperature fluctuations. We could be talking about severe thunderstorms in the Southeast by this time next week.